I have been testing out Juice Beauty's Green Apple Age Defy Moisturizer, and will be posting a review soon, and I will say that I am very impressed by their products. If you love their skincare, or have been wanting to try it– then their Friends & Family Event is the perfect time to shop. 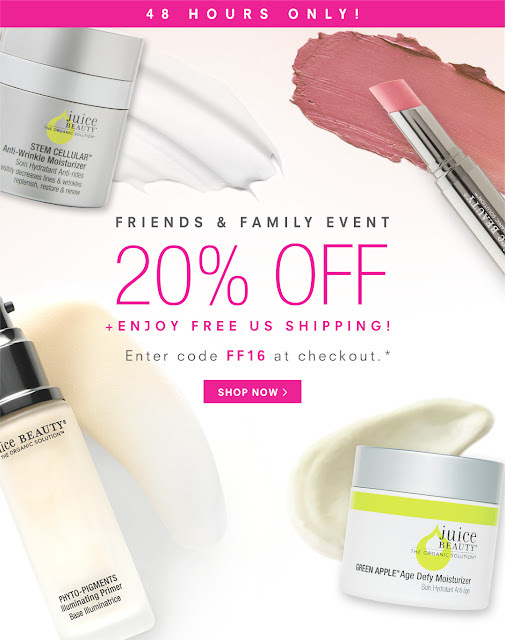 Juice Beauty is hosting their Friends & Family Event by offering you 20% Off, and FREE SHIPPING. Use Code: FF16 at checkout. Now Through November 4th, 2016 11:59 PST.